Ondutile is a unique roof underlay system utilising Onduline PP corrugated roof sheets below tile, slate or shingle roof coverings to create an independent secondary weatherproof roof. 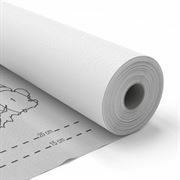 Ondutile is a unique roof underlay system utilising Onduline PP corrugated roof sheets below tiles. Designed for the Ondutile system and used in conjunction with the Eaves Ventilator Strip, it protects the eaves battern from possible water ingress whilst also providing an aesthetically pleasing finish to the eaves detail. Manufactured in a flat UPVC sheet with pre-formed fold lines to form a 75mm or 100mm drip edge into the gutter. It is used for Onduline, Ondutile and Oversheeting roof systems. The Ventilator Strips are used to allow ventilation into the roof space whilst preventing the infiltration of birds and large insects into the eaves. They are secured by nailing with galvanised round headed nails. Apron flashings are designed to seal the gap between Onduline sheets and vertical wall abutments. Suitable for any pitch of roof.